I would like to remove a store link to an item. I have a Master List called “Household” in it is the store “Menard’s”. Menard’s doesn’t have the pencil lead I need so I don’t want the lead to show when I view the Menard’s list. I can’t seem to find how to do this task. Matt, unfortunately there is no way to hide item from a specific sublist. The only way around is adding “pencil lead” item to a specific sublist of the master list, but the item will only be listed under that sublist and the master list. 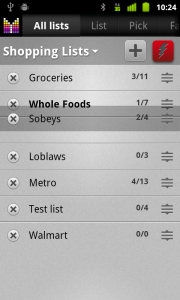 I want a master list for groceries and a sub list for Costco. 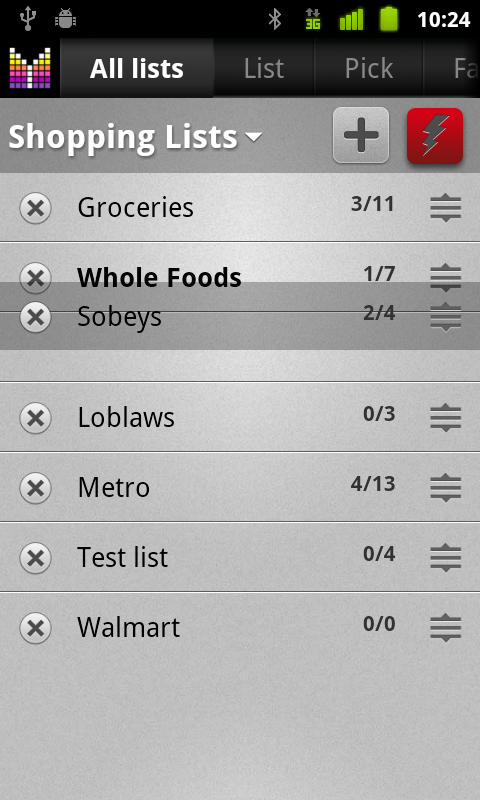 Mighty Grocery works for the two tasks. What I am having trouble setting up is when I have 30 items in the Costco list and I only need to buy 10 of them. How do I display only part of a sub list? In addition when I walk through the store I want to be able to check off the ten items one by one so I know when I get all 10. Zenwood, this sounds like you may need to use Favorites feature to build your list of 30 items. Then you could add 10 items to your shopping list and check them out just as you describe. 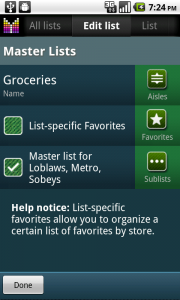 You may also want to consider the LIst-specific favorites feature if you need to have items per store. Is there a way to set the last price paid for items in the stores they were bought at if the item is bought at different stores? So if the item is added to a store list you see that stores price for the item and so you can compare different stores prices for the same items. Kindly note that every time you checkout from a shopping list, the item price is stored in History. Later, you can see item’s price history under Edit Item tab –> Link button (upper-left corner) –> Show price history. This will show all prices, including prices from other stores. Hi Dan, thanks for your suggestion. We may consider this feature going forward, though we will need more people interested in having it. Just installed full version of app today, and am pleased with the potential. 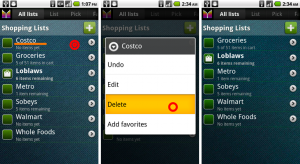 I was looking for an app that would allow me to edit lists via web while at my desk, categorize (aisles) items for easier shopping, and allow me to move items easily from one list to another on errand day when I could not find/did not like item from store1 and choose to look at another store. I am currently playing using a separate list for pantry items as a current work-around for that solution – look forward to upcoming dev on that. I do have a question. I’m working on wrappinig my head around the Master/Sub Lists relationships; and I think what I’m asking goes the other way. If I create a master list ‘groceries’ and then link it to other lists (i.e Kroger, WalMart, Costco), what about linking other lists and/or items to those stores as well? For example, at Kroger I would only utilize items from Grocery, but there might be additional items I shop for at WalMart that are not available at Kroger (i.e. socks). Is there a way to handle this with master/sub lists? Or am I better just keeping all items in the ‘All Lists’ category and going from there? Thanks again for creating what promises to be well used, much needed app for me! Hi Dotthen, thanks so much for your feedback and your question. I am not sure if this will work for you, though you could create another master-list, say “Clothes” and add applicable stores like Walmart or Sears there. Any item added to “Clothes” master-list will show up in sub-lists but won’t be displayed under other lists such as Kroger. Hi Chris, thanks for your questions. 1. Not sure about changing the voice. Do you mean adding items using voice? Yes, it is possible to add items using voice while shopping if you have Internet connection. 2. Yes, there is a total of you bill in the bottom of the screen. 3. No, the app will not remind you to buy anything. It’s planned to consider in the future. 4. Yes, the app is compatible with Samsung Galaxy Ace. I’d recommend trying the Lite version (Free) of the app to see if it fits your needs. I don’t want to be a downer so you don’t have to add this to your website. In response to your last comment, Alex, my “List-specific Favorites” for Wal-Mart WAS set to ON, as was “Master list” and “Sync list via Default account”. I unchecked Master list to see if that would help. All of my Wal-Mart Favorites disappeared, as did my all of the days of work sorting them by aisle. I’m almost back to zero. “Sync status details” is set to “Detailed”. “Polling interval” is set to 30 seconds. Your product has the potential of being the best shopping app available, but it needs some serious work before it is viable beyond massive frustration. I’m not going to ask for a refund because I’m hoping you will soon make those improvements. but only one Favorite was restored. I know more were included in the backup, because SOME of the Wal-Mart items are included again under List. Backup MUST backup EVERY speck of data and restore all of it. I think the ability that some of the competition offers to add icons is silly, a waste of time and takes up too much space on the line. If it were added there should be an opt-out option. 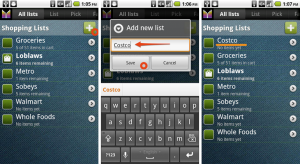 Pantry with easy-to-edit features so that changes can quickly be made each day as items are used. In Pantry, ability to add number of full items PLUS an Empty-Full slider. Just a slider is not enough, nor is just the number of full items. If I add an item to the Wal-Mart shopping list the identical item will be added to other grocery store lists where that item is listed in the Favorites of that store. That way, if Wal-Mart is out of the item it will already be on the lists of other stores I would go to for that item. We shouldn’t have to add the same item to the list of different stores for the same shopping trip. It would be very helpful to have a date reminder. I know that I’ll run out of a 120 capsule bottle of multi-vitamins on a particular date. I could set a reminder for a date or a certain number of days to be reminded that I need the item. It would be good to have a simple method for adding some sort of priority mark for a list item, whether by text color or some other method. Some of the competition saves the files in .csv so they can be edited in Excel. It would be even better to be able to edit in the same format on a computer screen as the app appears on the phone. Hi Doug, thank you so much for your comment. I am sorry for the inconvenience, but let me assure you that backup on cloud saves all the data from the app. I’d recommend creating backup right after you’ve accomplished lots of configuration activities to make sure your changes are stored elsewhere. Thank you for your suggestions, Pantry, Price compare, csv export, Anvanced Web UI features are planned soon. Other feature will be considered as well. Hi James, thanks so much for your feedback. Kindly note that price per list feature is planned and I hope it will be available soon. Unfortunately, no specific timeline yet. I’m adding favorites for WalMart. I’ve already set up WalMart Aisles. However, when I open an item for editing to assign the aisle, only the preexisting aisles are displayed, not those that I created. How do I assign the correct aisles? Hi Doug, thank you for your interest in our app and your question. Kindly note that due to unfortunate bug, List-specific favorites use “All lists”aisle configuration instead of that list specific aisle configuration. This issue is scheduled to be fixed in the upcoming release(s). In the meantime, you may want to try a workaround: add new items to shopping list from list-specific Favorites and then change aisle for item in shopping list (not Favorites). You will notice that selection of aisles in Aisles field will match your list configuration, and when you change a value of aisle it will propagate to Favorite items. I’m glad you are addressing this issue. All of my shopping has been organized by aisles since my PDA days, which is the reason I purchased MG rather than the competition. Your suggestion works, but it raises another issue. 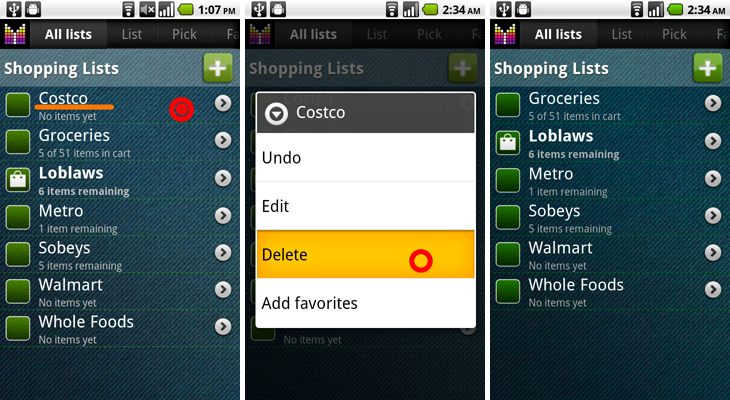 In the List screen I am able to access my personalized aisles in edit mode for each item. 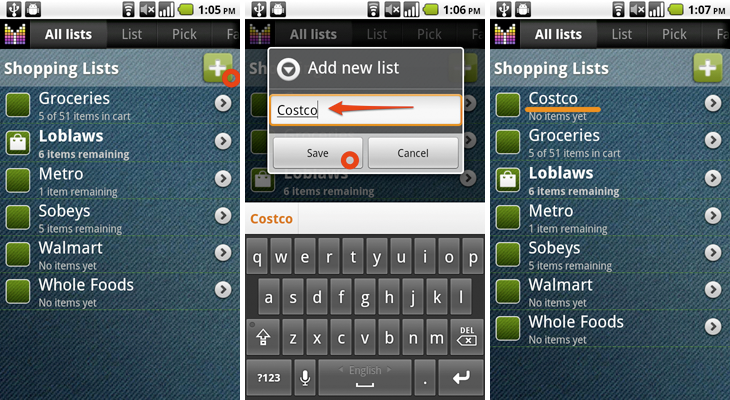 However, the aisles headings are not displayed like they are in Favorites. Also, the items on the list are not organized by aisle. I haven’t tried yet to set up Aisles for other stores. I’m assuming that by following your suggestion I will be able to assign store-specific aisles to items. Please add the ability to move items out of Barcodes to different Favorites and Lists. I got carried away before I read the instructions and now I have dozens of items stuck in the Barcodes list with no (apparent) way to move them to Favorites or the Master List. While I’m in “Suggestions” mode I have another. In Aisles there is a “Reset” button at the top right, which makes me VERY nervous. I’m not going to try it to see what would happen if I inadvertently pushed it. It would be extremely annoying if I were to undo all of the work I did on the WalMart aisles. It would be very helpful if this button was available, but not so accessible that it can be pushed by accident. In case it makes a difference (I know that Android isn’t perfect) I’m using an Atrix with the Gingerbread update. Kindly note that your aisles in Favorites are sorted according to “Any list” configuration because your Walmart list has “List-specific favorites” setting set to OFF. If you’d like your Walmart Favorites to use Walmart aisle configuration, I’d recommend changing List-specific favorites setting to ON. As for barcodes, sorry for the inconvenience. In the meantime I’d recommend scanning barcodes under the list where you’d like them to move. All your changes to titles/comments will move as well. As for Reset button, kindly note that you can Undo any action you do in Mighty Grocery. Just tap Menu –> Undo to revert changes. Also, creating backups is a good strategy to keep your data in a safe place. Thanks again for your comments and I look forward to hearing from you again. I just got the MG, and have not yet gone shoping. After reading the reviews, and looking at other like products I think this will be great. My question is: How do you move items that you enter to there correct spot on the list? I added a canned fruit to the list you pick from, and it went under “other” instead of can goods. How do I move the fruit to can goods? I don’t want to make another list, just reorganize the one I have. Thanks for your in put into this question. LuWho, thank you for your question. Kindly note that to assign an item to a different aisle, just open item for editing, tap Aisle field and choose aisle for the item. See Edit item details User’s Guide for more details. Thanks and let me know if you have any further questions.